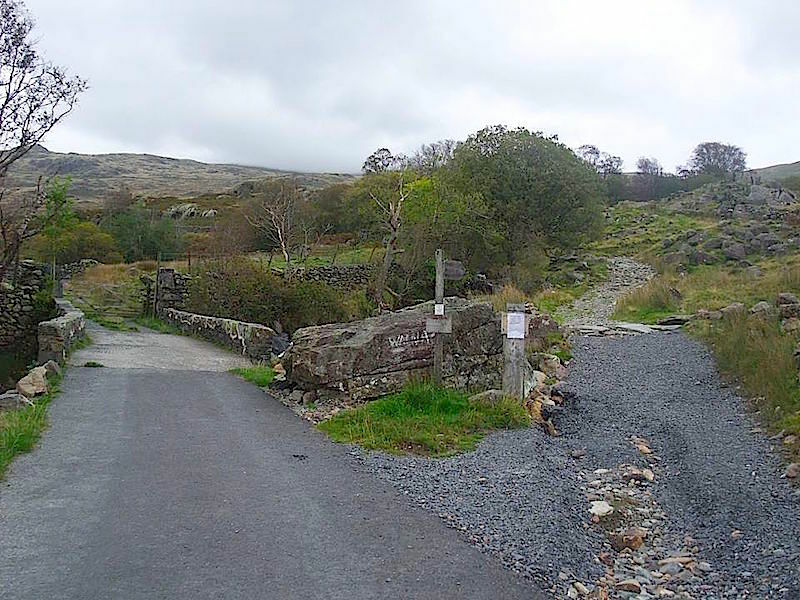 Today’s walk sees us starting out from Seathwaite, just to the west of Coniston, using the Walna Scar road, an old track which runs between Seathwaite and Coniston. Looking ahead as we approach the Walna Pass, there’s not a lot to see at the moment as the cloud is down. 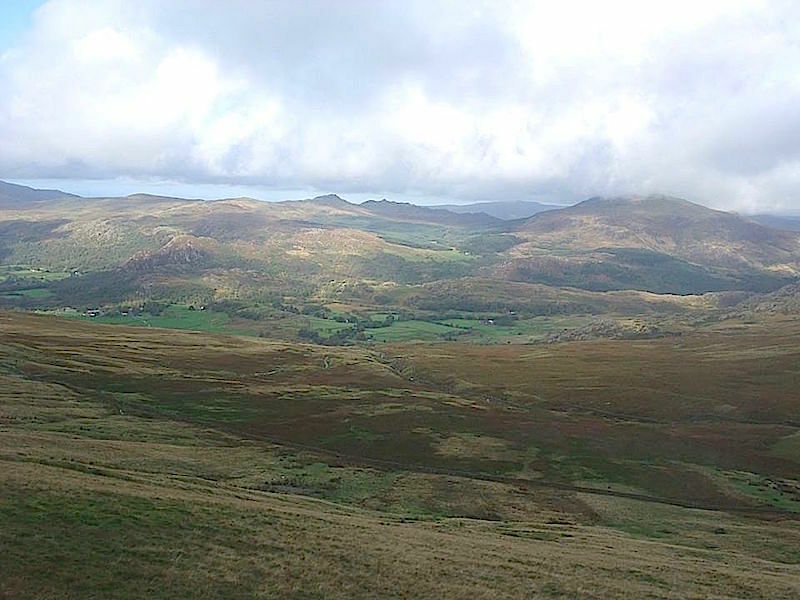 Looking back across the Duddon Valley, and the fells beyond. Harter Fell over to the right still has some wisps of cloud hanging on to it. 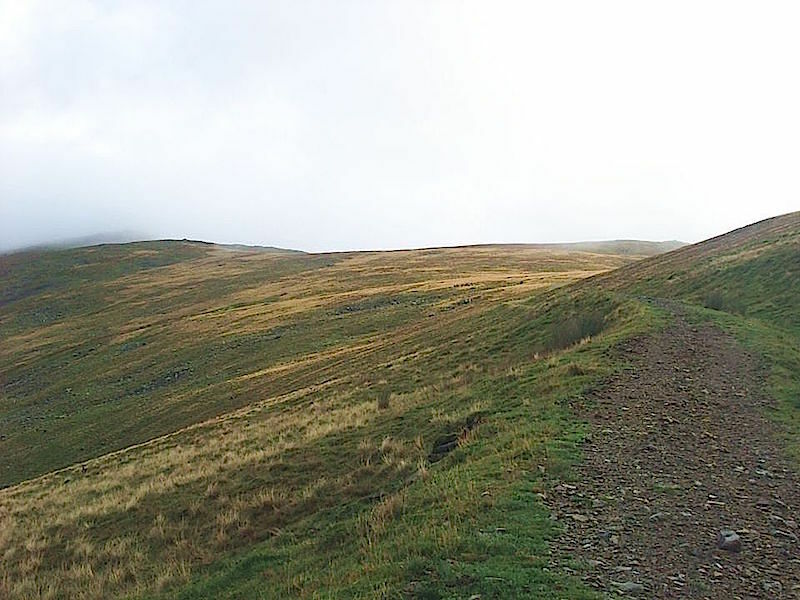 Just before we reached the top of the pass we turned off to the left to make our way up to Brown Pike, a section of the path to it is visible over to the left of the picture. 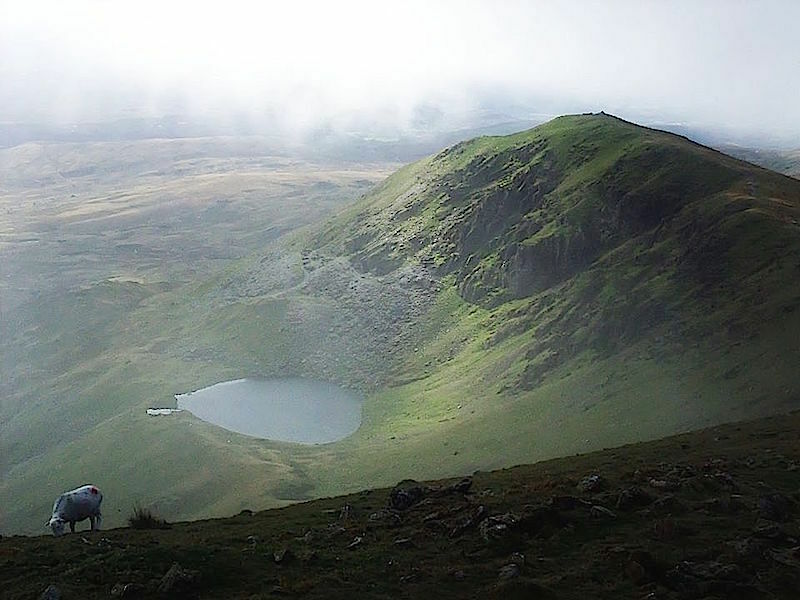 Further along the route and I take a look back at Brown Pike with Blind Tarn below it, the swirling mist adding to the atmospherics of the place. 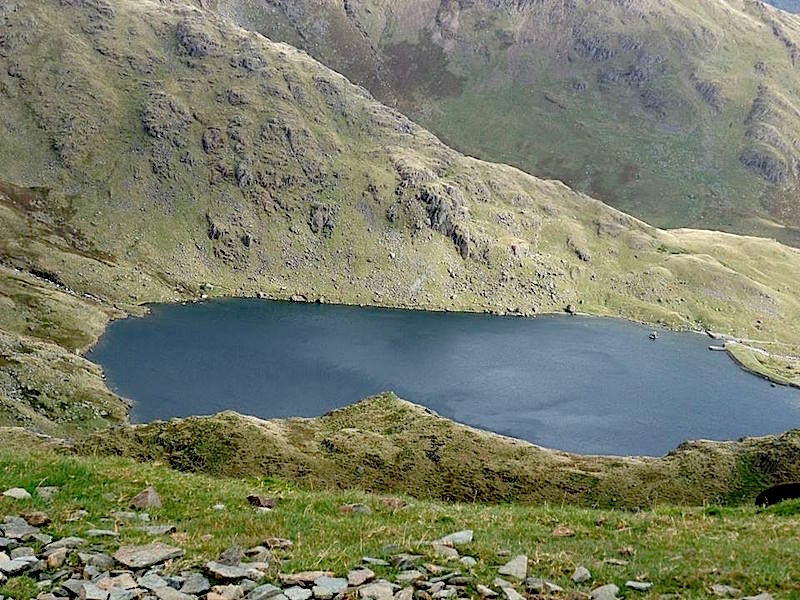 The tarn is so named since it has no apparent inflow or outflow. 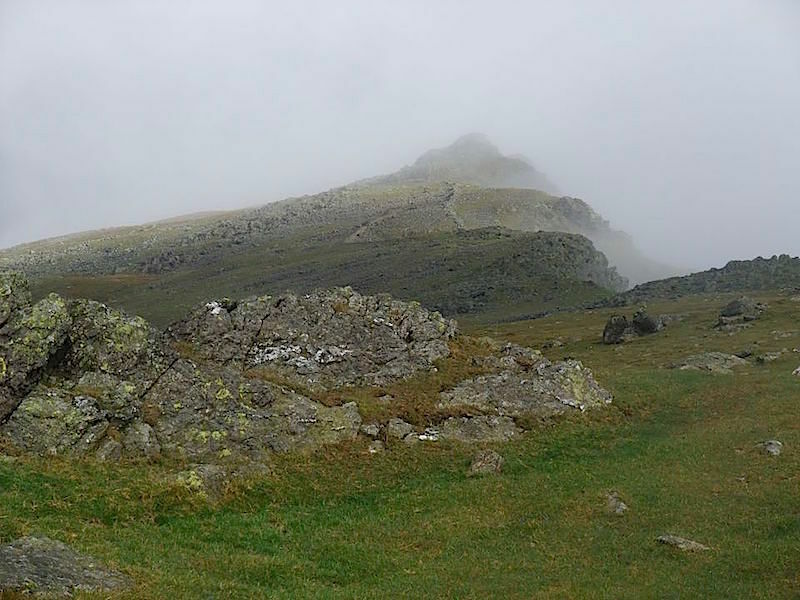 Ahead of us the ghostly shape of Dow Crag appears and disappears as the mist swirls around it. 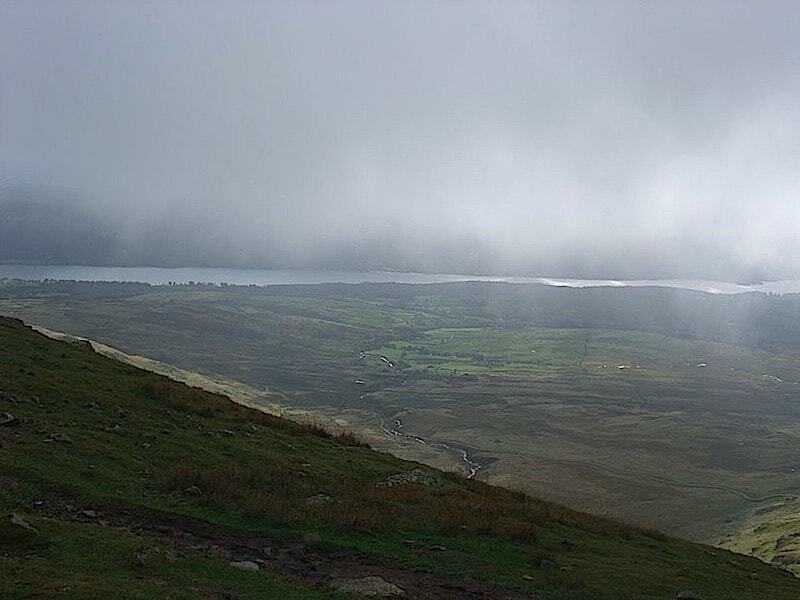 The mist very slowly dissipates and eventually we get a glimpse of Coniston Water over on our right. 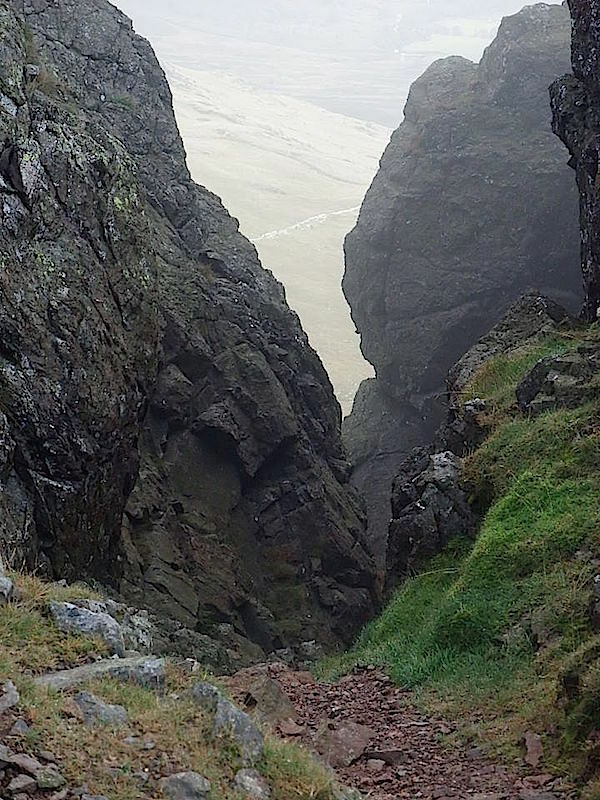 The view through Great Gully on Dow Crag. 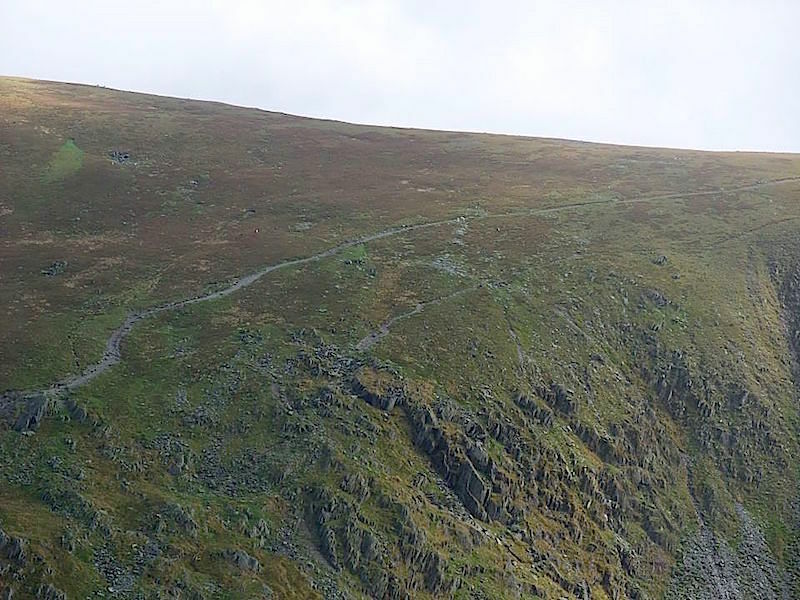 The white line way down below, between the two cliffs, is the Coniston side of the Walna Scar road. 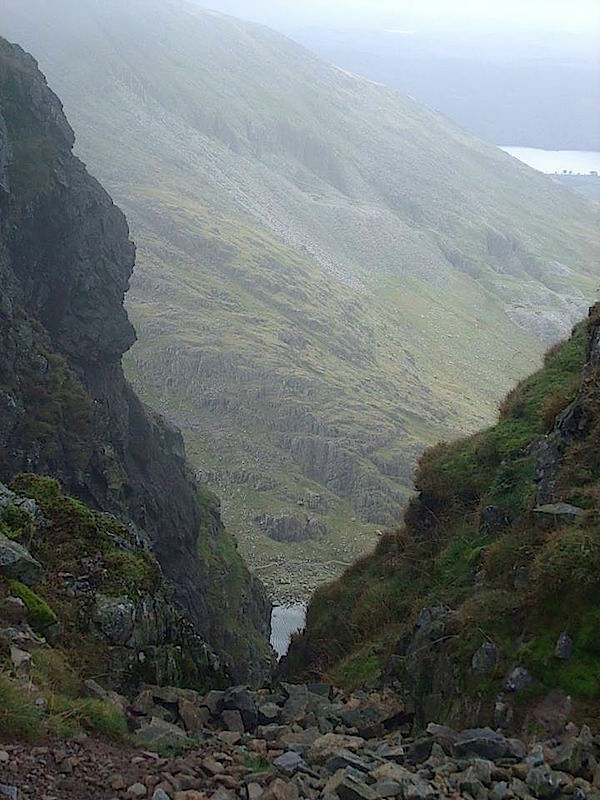 Looking down another of Dow Crag’s huge gullies gives a tiny glimpse of Goat’s Water, which lies between Dow Crag and Coniston Old Man. The amount of clothes I’m wearing tells you everything you need to know about the weather. The sun glasses were on simply to keep the wind out of my eyes. 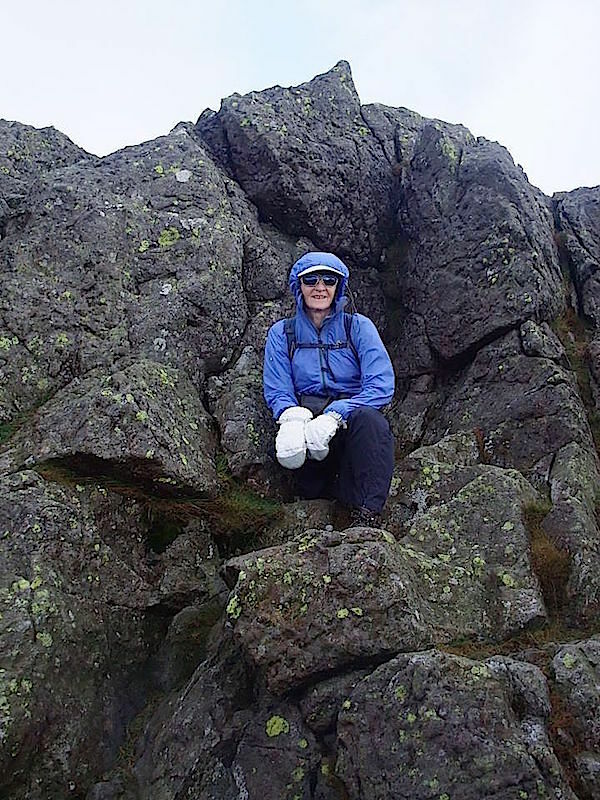 Here I’m taking shelter for a minute or two amongst the summit rocks on Dow Crag just to get a bit of respite from the battering wind. No standing on the very top today, its much too windy, but you can still take a quick peek over. I’m not going to stand on the top either, but I will go and take a look over too. Notice what’s happened now that I’ve taken my sunglasses off. 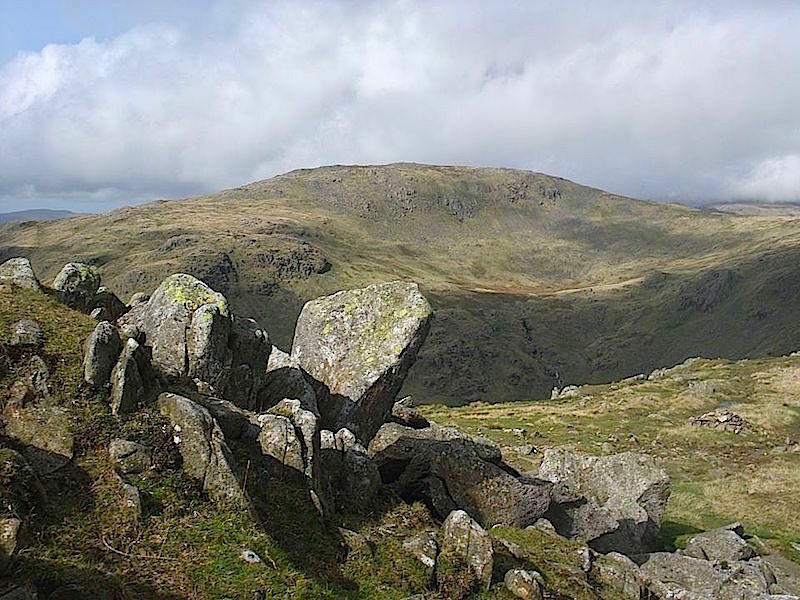 Across from us is the path from Goat’s Hause over to the summit of Coniston Old Man, which is just out of shot over on the right. 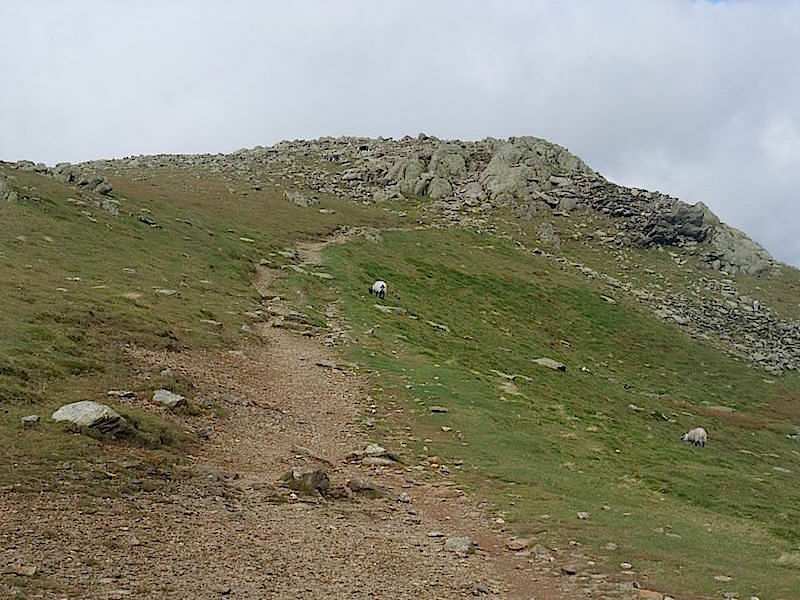 Here’s where the path in the previous shot leads to, the summit of Coniston Old Man over on the far right. 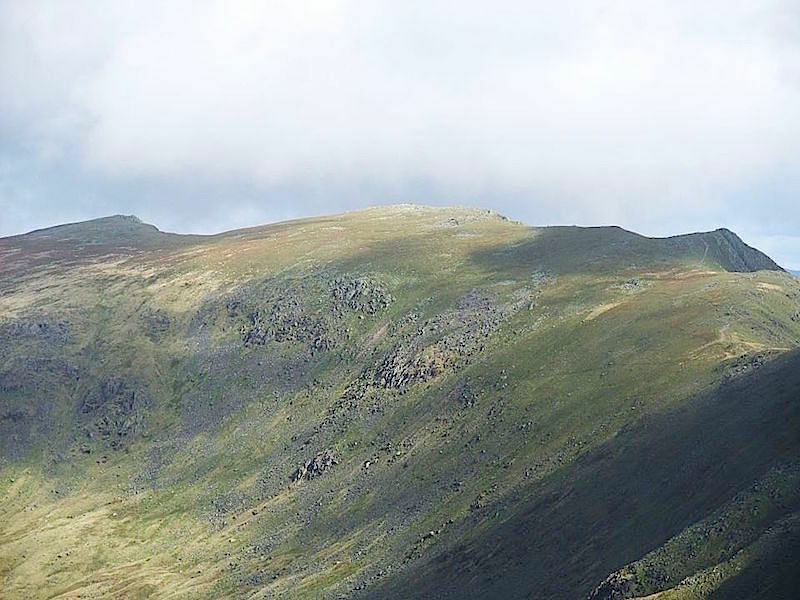 From left to right on the skyline we have a view of Grey Friar, Great Carrs and Swirl How as we begin the descent from Dow Crag. 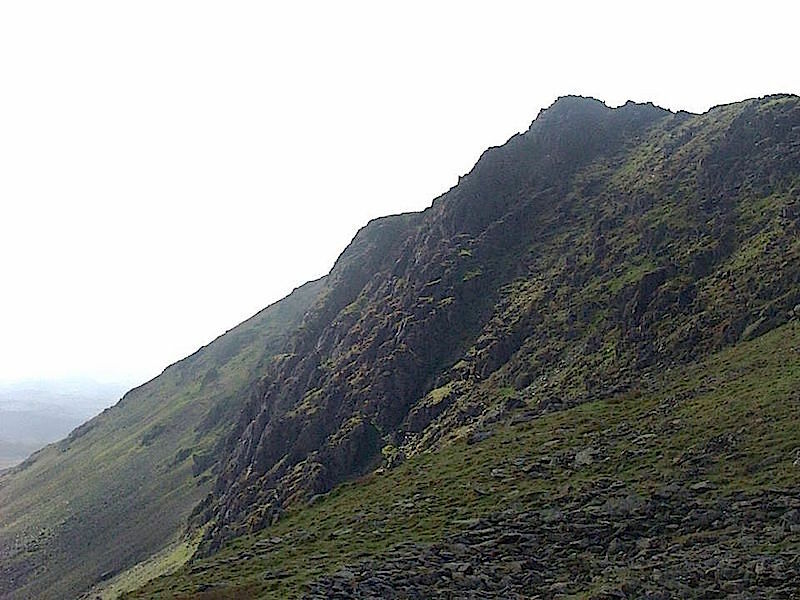 Dow Crag from the path down to Goat’s Hause. The view explains why we didn’t think it a good idea to stand on the very top in such a strong wind. A shimmering Goat’s Water from our descent to Goat’s Hause. 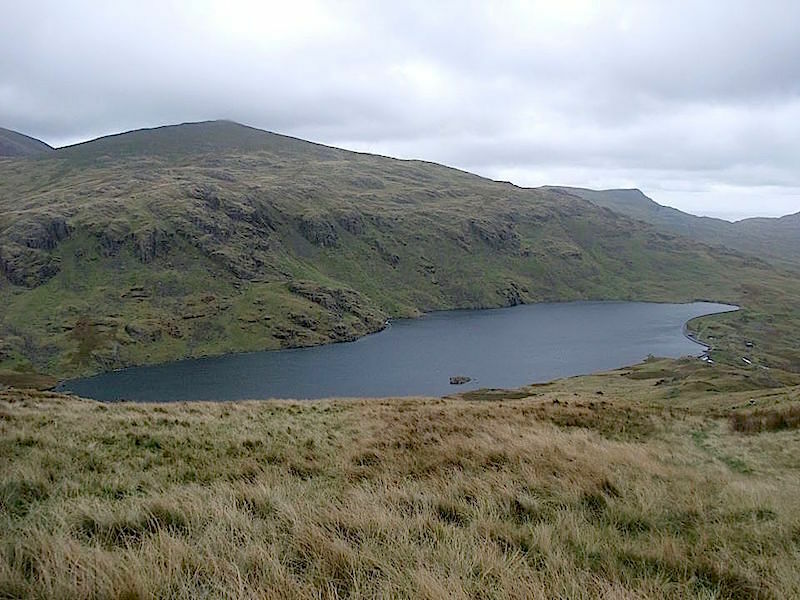 Over in the upper right corner is the Coniston side of the Walna Scar road. 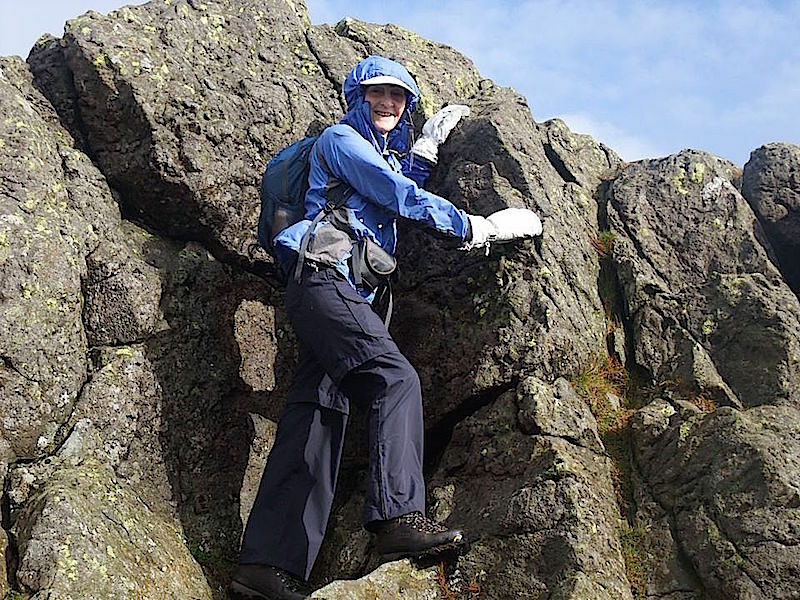 Another look back at, and up to, the towering cliffs of Dow Crag. A popular destination for rock climbers, a terrifying activity for the rest of us, I would imagine. 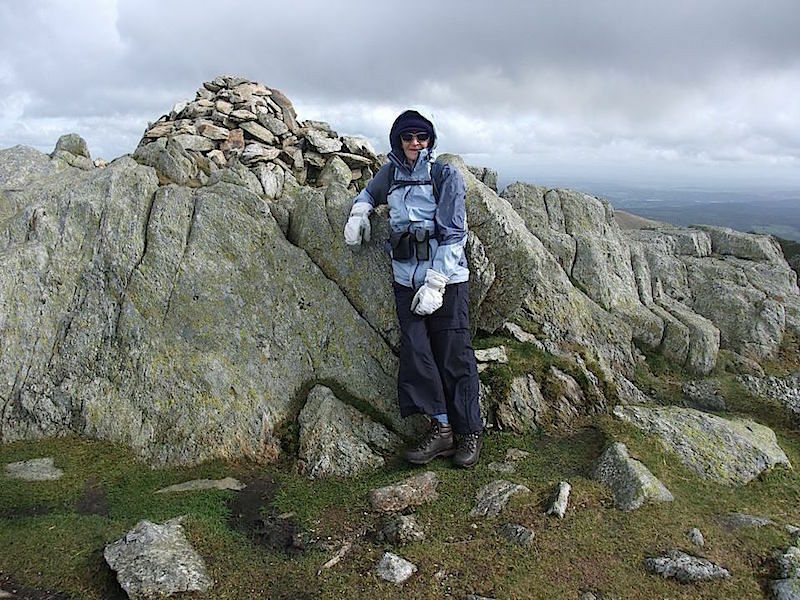 From Goat’s Hause we took a path over to our left which brought us over to Brim Fell and its beehive shaped cairn. 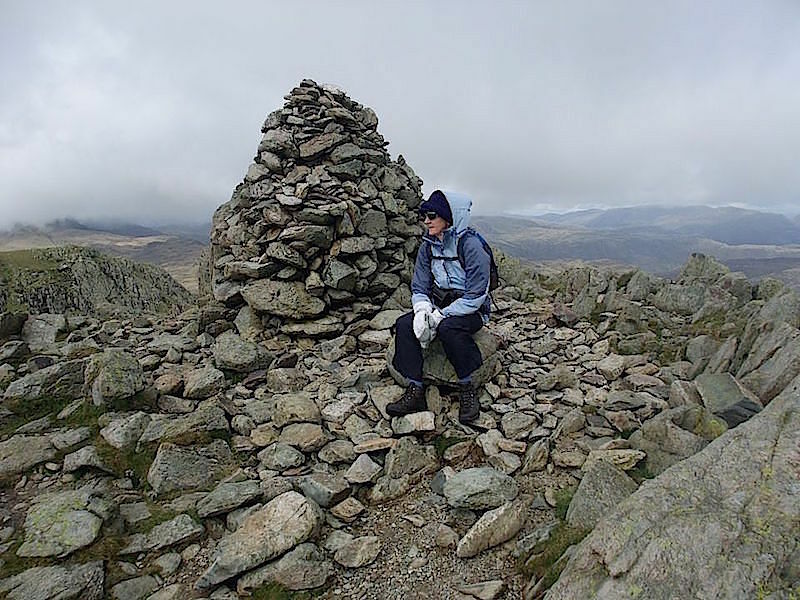 On the skyline to the left of the cairn is Dow Crag where we’ve just walked from. 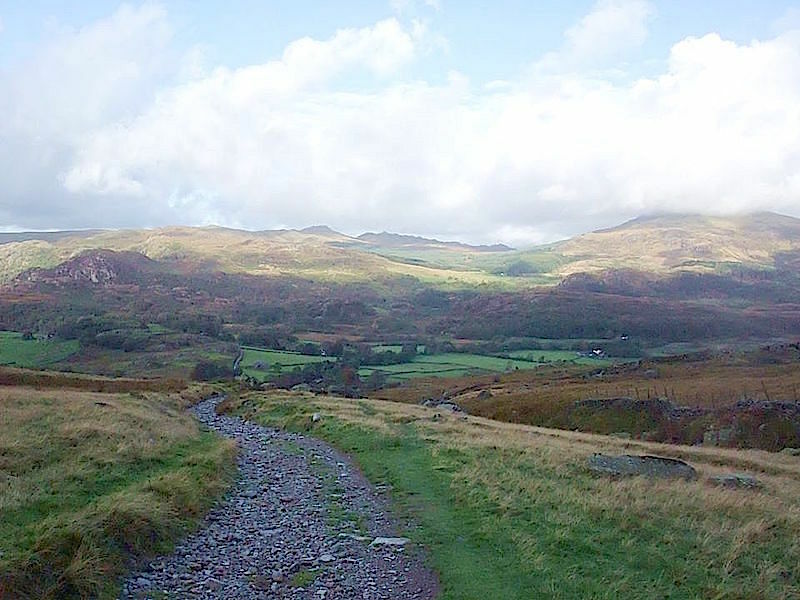 From Brim Fell a look down to Levers Water, with the lower slopes of Wetherlam on the far side of it. 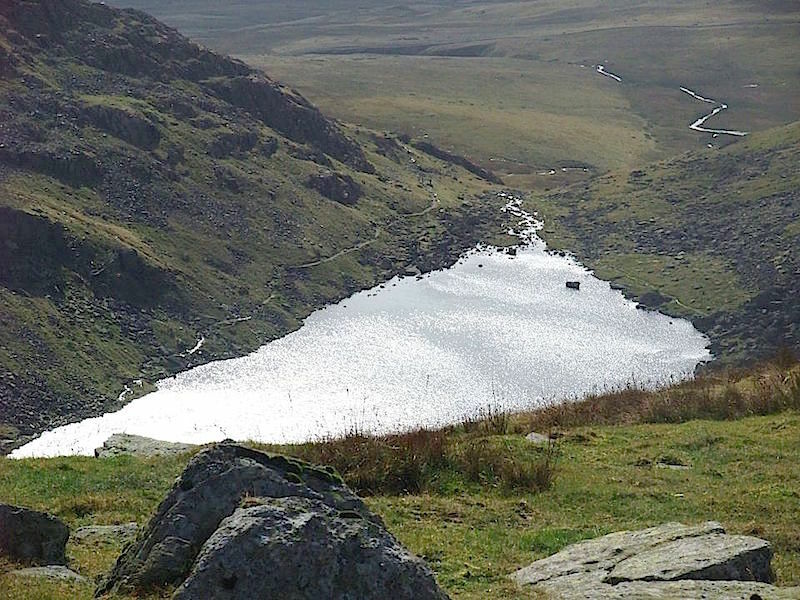 No reflections on the tarn today, the wind is whipping the water in all directions. It was a bit nippy at our lunch stop by Levers Hause, with hands being rubbed to get some warmth back into them. It didn’t seem to make any difference where we chose to sit the wind still managed to find us. 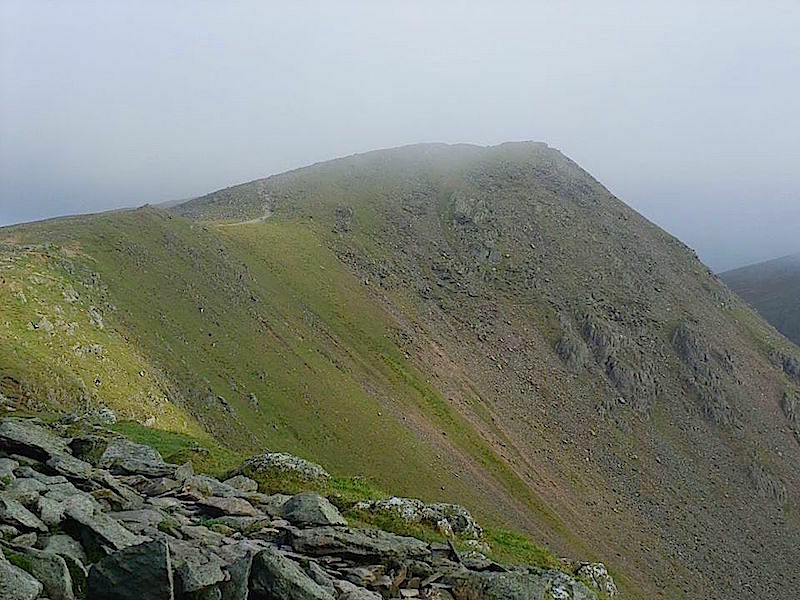 The path ahead will lead us over Little and Great How Crags and then on to Swirl How. 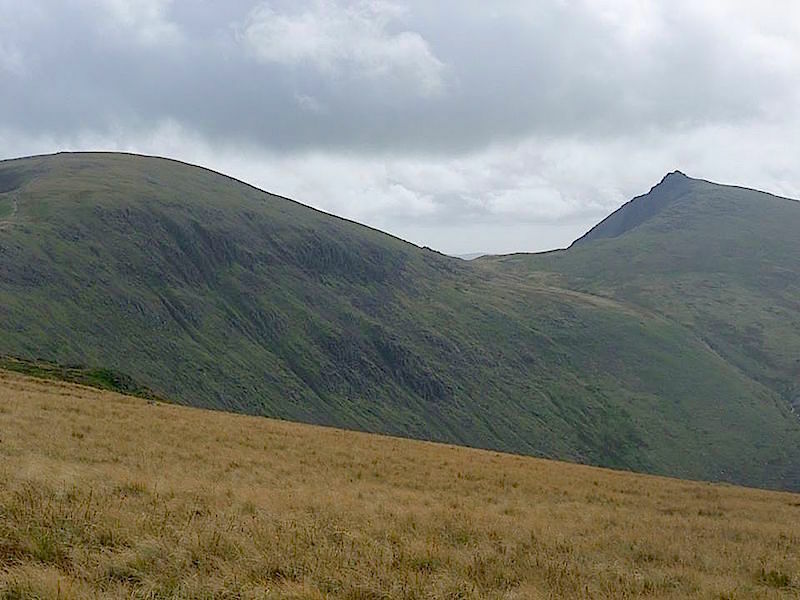 Across to our left, from our lunch spot, is Grey Friar which will be the last fell on our walk today. By the time I’d taken this shot and the previous one my fingers were numb with cold so the gloves had to go back on. Have you ever tried eating a sandwich while wearing thick winter mittens? 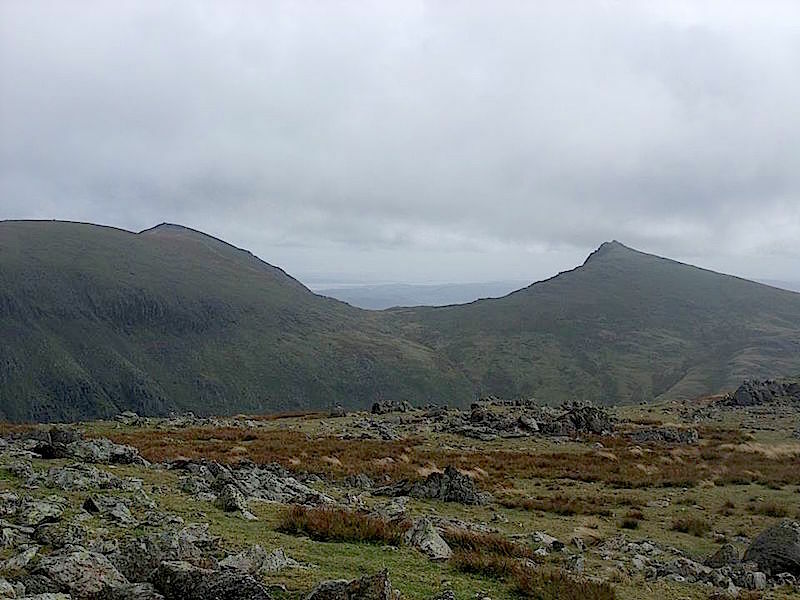 After lunch we continue along the ridge towards the How Crags. Swirl How’s summit, rocky, deserted and even colder than it was back at the lunch stop. As well as the mittens I’ve added another jacket, a woolly hat, the jacket hood and I’m still not that warm. 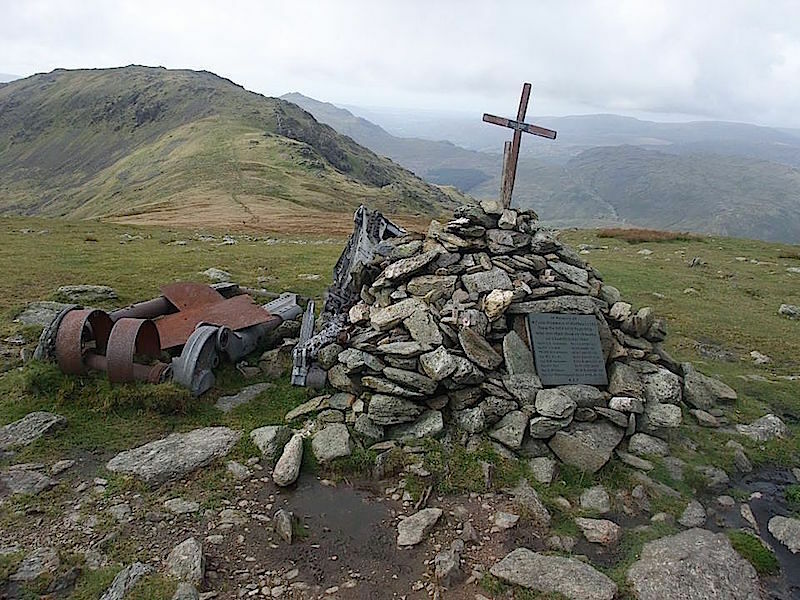 From Swirl How we made our way over to the memorial to the crew of a Halifax bomber which crashed here during a training flight. 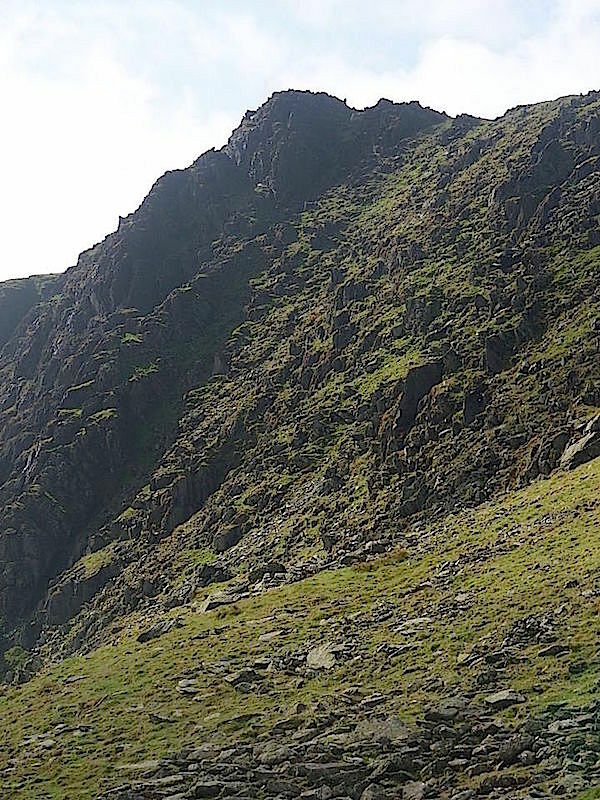 Its sited just a little way below the summit of Great Carrs. Its only a short walk to get here from Swirl How but it was hard work battling against the wind which was constantly pushing us backwards. 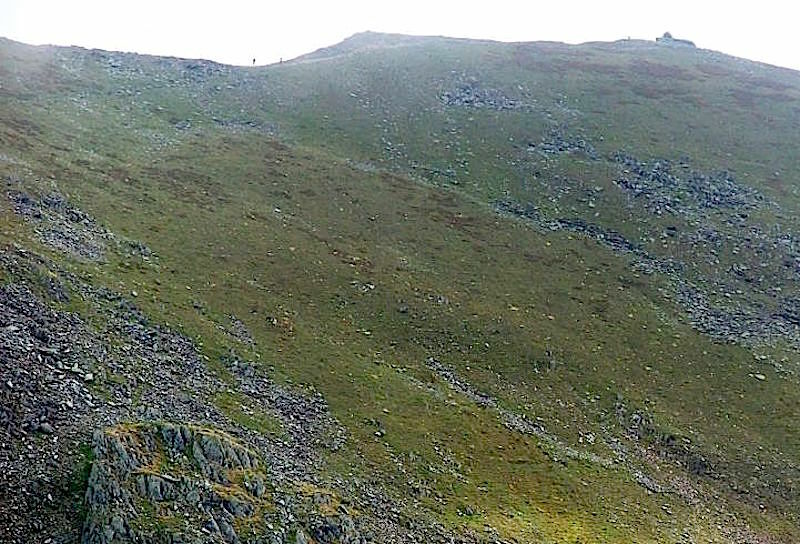 Ahead of us is our final fell of the day, Grey Friar. 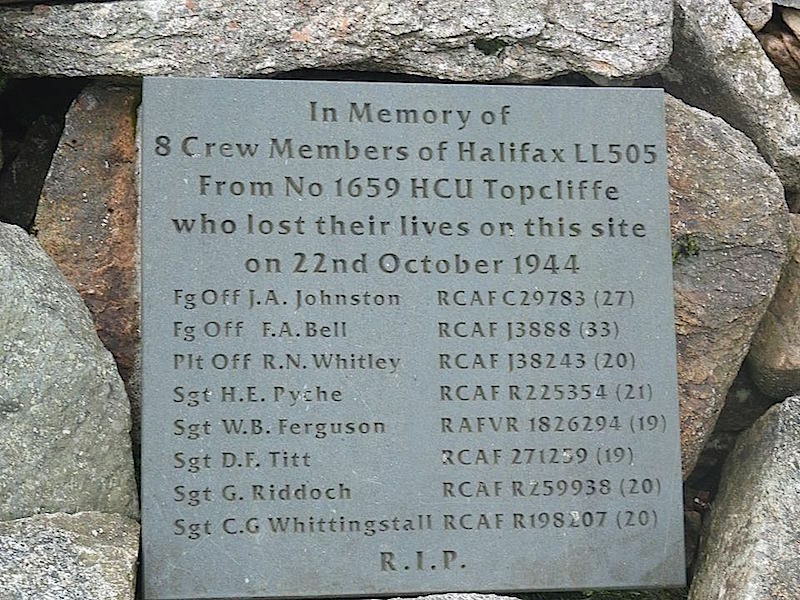 The memorial tablet to the crew of the crashed aeroplane. 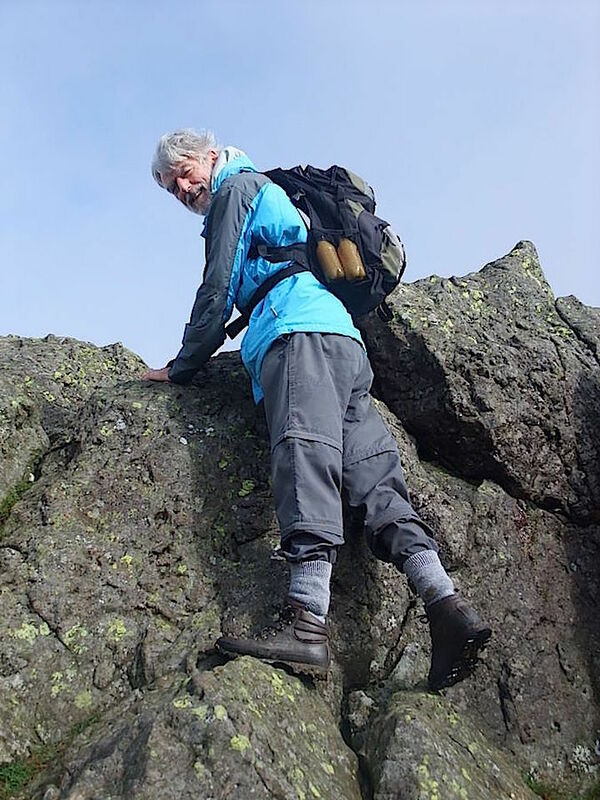 Great Carrs summit, where it might be sunny but it was absolutely perishing. Looking over to Grey Friar from Great Carrs. Over on the right is Harter Fell, now cloud free. 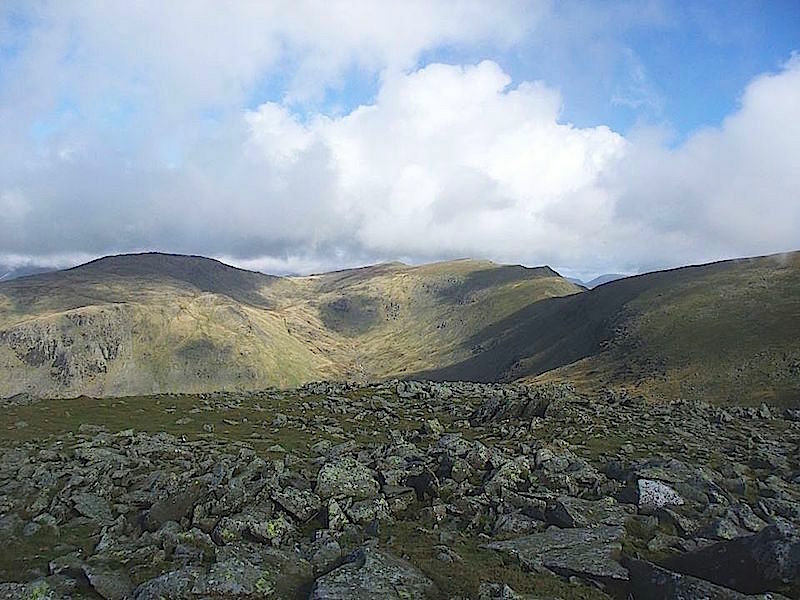 From Great Carrs we make our way over to Grey Friar with this view of Brim Fell and Dow Crag over on our left. The force of the wind was blowing us sideways across here. The sunglasses went back on, hoods and hats pulled well down, anything to stop the eyes watering. 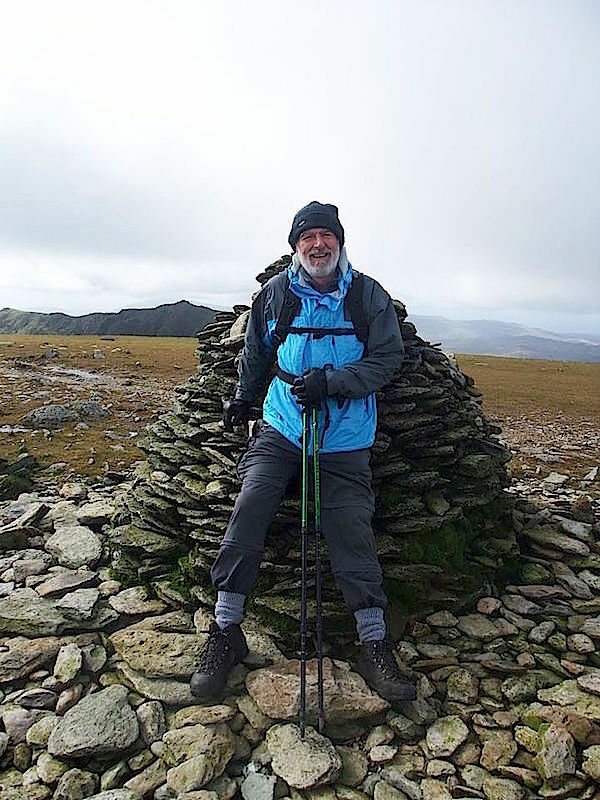 On Grey Friar there are two cairns, each one on a rocky outcrop just a few yards opposite each other. 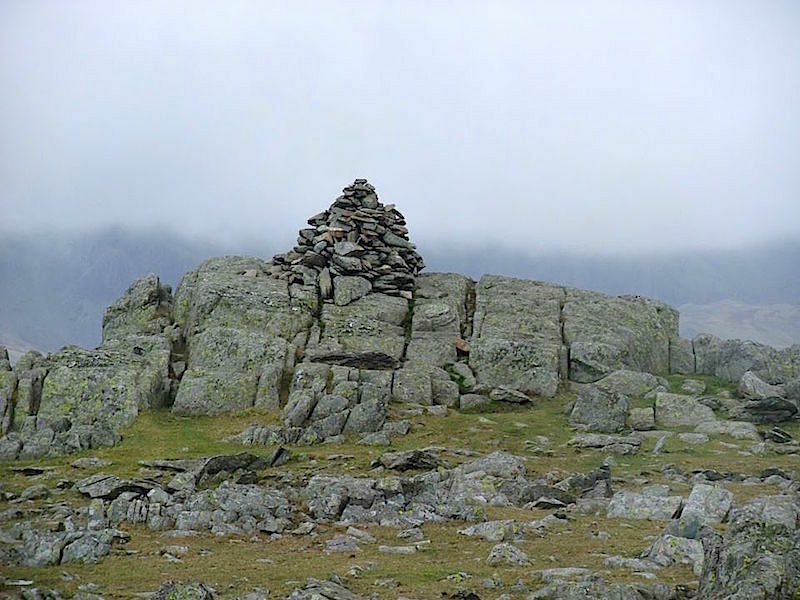 This is the lower of the two cairns although its only a matter of inches rather than feet. 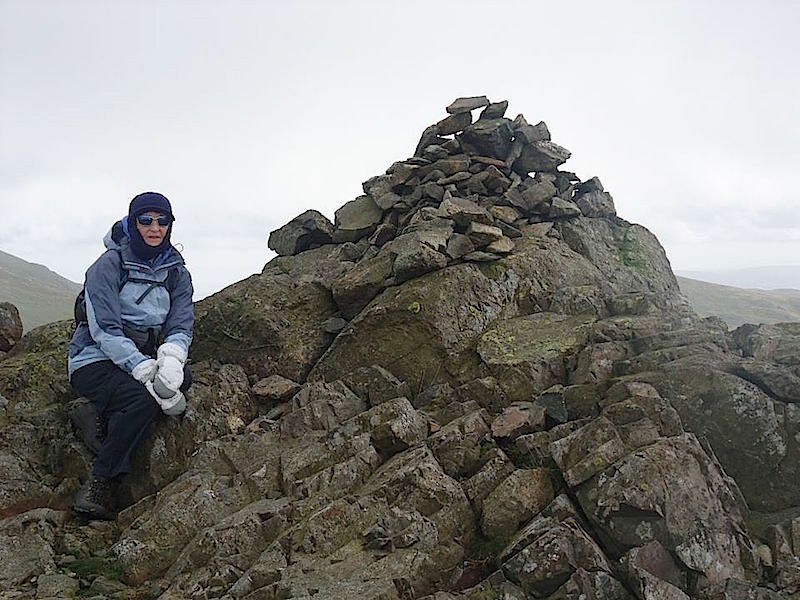 This is the second cairn on a very chilly Grey Friar. The woolly hat has now become a balaclava and I’m beginning to look more like a polar explorer than a fell walker. 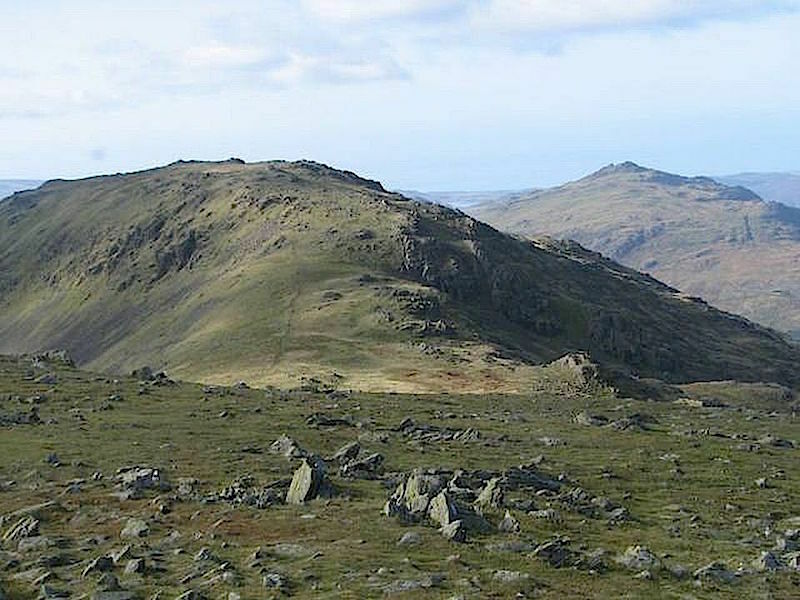 A view of Coniston Old Man, on the left, and Dow Crag, on the right, from Grey Friar. 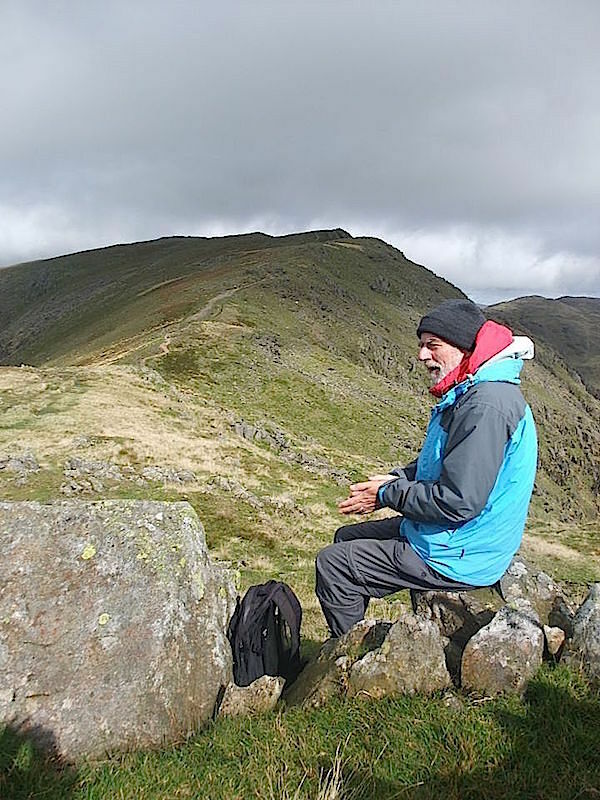 From Grey Friar summit we walk down Troutal Fell to Seathwaite Tarn. 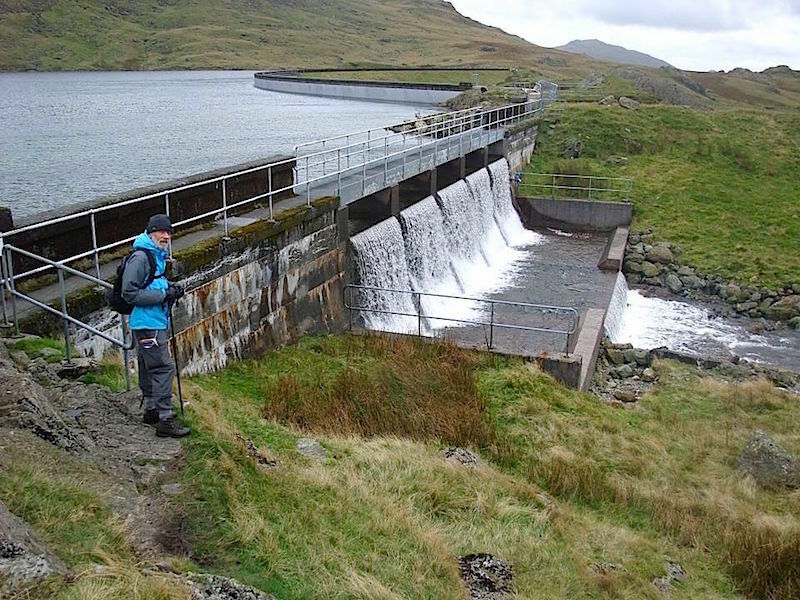 The tarn dam begins to come into view as we follow the easy grassy path off Troutal Fell. Water roaring over the outflow of Seathwaite Tarn dam. 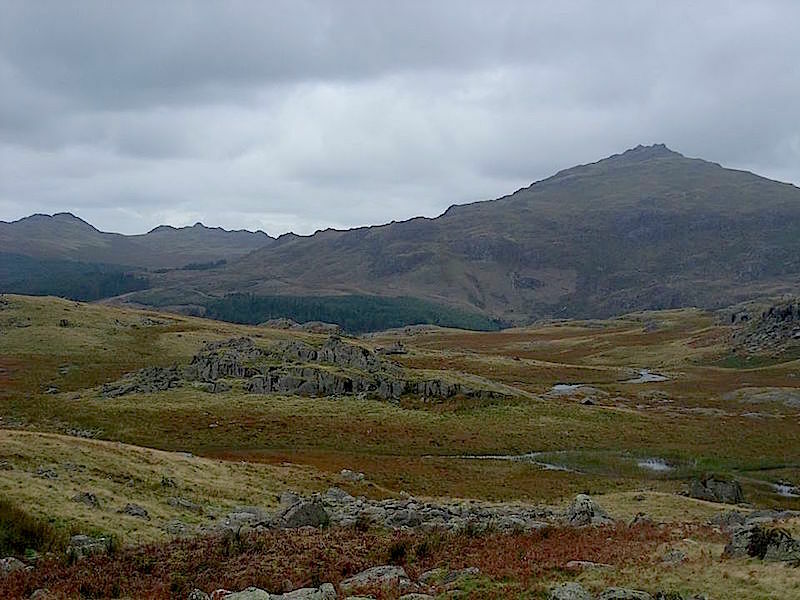 Harter Fell, on the right, with Green Crag on the far left as we make our way back to the car. 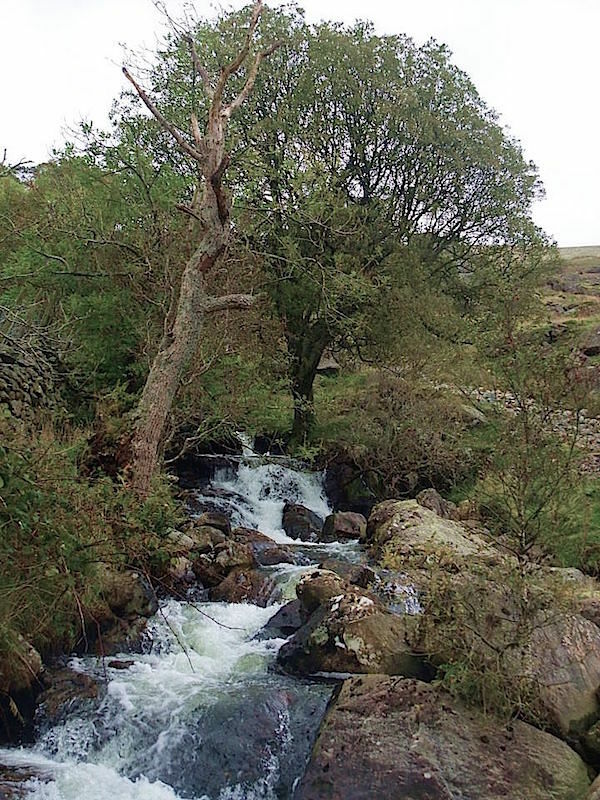 Long House Gill in full flow as we reach the end of the path. The start and end of the walk. 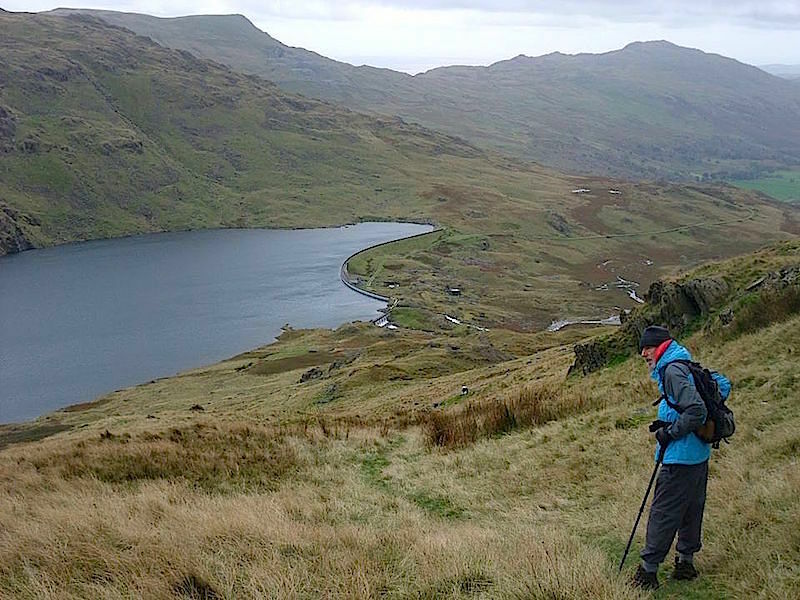 The path to the right is the one we took when we started out this morning and the path to the left is the one we have just walked down from Seathwaite Tarn. 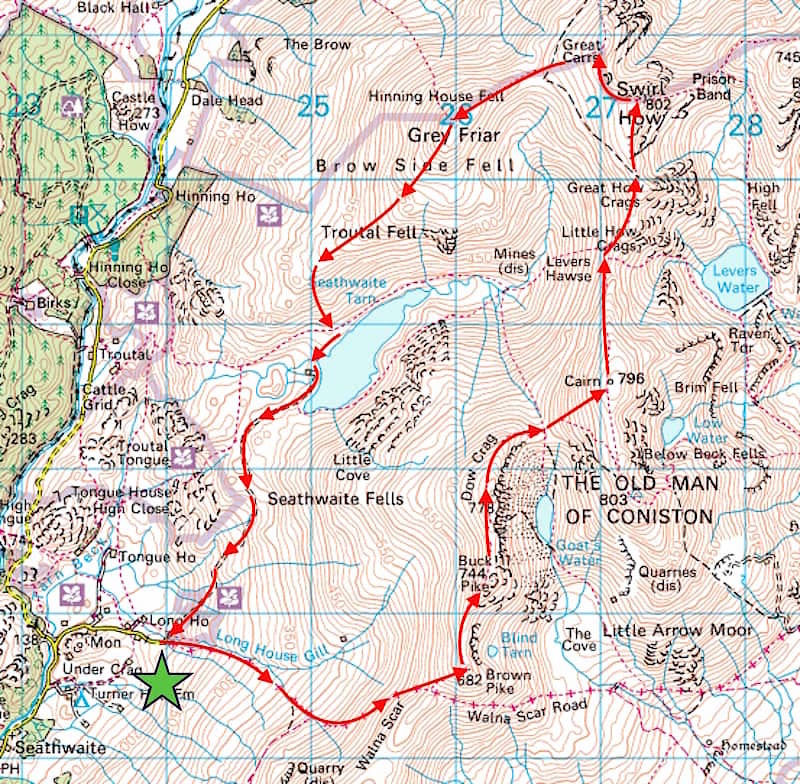 A great circular walk, its a shame the weather wasn’t just as great.